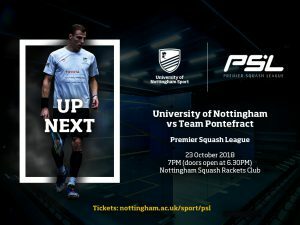 Premier Squash League is back with a bang and University of Nottingham will be challenging in the new look format when the new season gets underway in September. Organised by England Squash, the Premier Squash League is the top domestic professional team league. Each match night will see 5 fixtures played, 4 male, 1 female, playing best of 5 matches, first to 11 points. The season culminates with a grand final in May in front of a sell-out crowd. This year is set to be equally exciting and competitive with the addition of two teams joining the league, Squash Wales and Newcastle University / Northumberland Club. The addition of the two teams has made the league title even more of a prestigious achievement. The action will be returning to the all-glass court at David Ross Sports Village and Nottingham Squash Rackets Club, set in the historic Park neighbourhood in the shadow of Nottingham Castle. As previous champions in 2016/17, University of Nottingham will once again be in contention for the 2018/19 PSL title. The squad features some of the world’s best players and England’s rising stars including former World No. 1 Nick Matthew and Commonwealth Bronze medallist Declan James. The team also includes students from the University’s performance squash programme including reigning BUCS individual champion Coline Aumard and two-time National British Universities champion Hana Ramadan. After a successful summer on the PSA world tour both will be looking to make their mark in this year’s PSL. Nottingham are ready to come back fighting, after narrowly missing out on the final last season, promising top class sport performance and entertainment for all spectators. 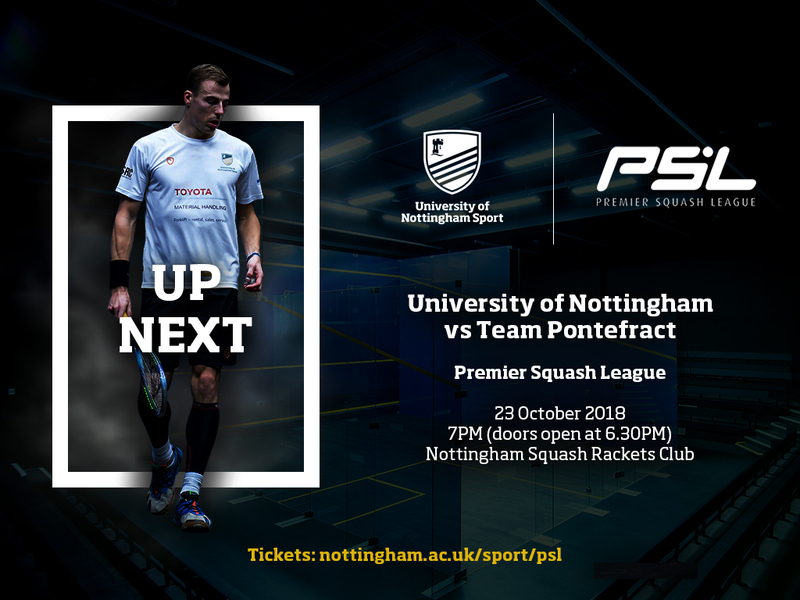 The next home match will take place on Tuesday 23rd October 2018, University of Nottingham vs Pontefract and will be hosted at Nottingham Squash Rackets Club. The following home match on 4th December will be hosted at the University of Nottingham when the University of Nottingham take on Bristol.